Russia’s mainstream media and President Vladimir Putin continue to remain silent about numerous prisoners of Putin’s undeclared war against Ukraine. Pilot Nadiya Savchenko and 30 other Ukrainian service members are still being illegally held in Russian jails. Taking hostages is one of Russia’s Hamas-style tactics against its perceived enemies – foreign and domestic. In that sense, Nadiya is much more than a prisoner. To Putin and his regime, she is the symbol of Ukraine itself: spirited, strong and unbroken. In a video of her interrogation, Nadiya said that she does not expect to return home alive, but is not afraid. The brave pilot has entered the third week of her hunger strike, during relative media silence. In the meantime, Savchenko’s attorneys are fighting an uphill battle, seeking justice in kangaroo courts of Russia’s Banana Republic. To break the media silence, activists all over the world are taking Twitter by storm with a trending campaign, #FreeSavchenko. Appealing to the conscience of Russia’s leading gray apparatchik is not what truly matters. The collective conscience of the world must be awakened to speak out and take action against many injustices perpetrated by Russia in its undeclared war against Ukraine. While American self-professed truth-seeker Oliver Stone was having a tea party with Ukraine’s former President Viktor Yanukovych, he didn’t raise any questions about the unlawful detention of Ukraine’s POWs in Russian prisons. 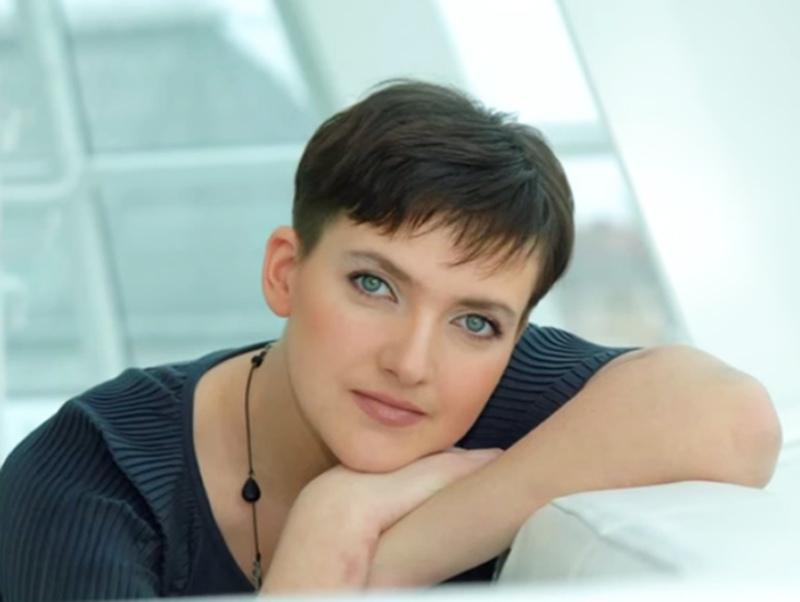 Nadiya Savchenko was born in Kyiv and brought up in a patriotic household. She joined the army at 16 and in the mid-2000s was the only female Ukrainian to serve alongside the U.S. forces in Iraq. She is the only Ukrainian woman who can pilot the Su-24 bomber and Mi-24 helicopter. Nadiya Savchenko was captured on June 18, 2014 by pro-Russian terrorists near Luhansk, while she was on a mission to rescue wounded Ukrainian soldiers. Nadiya was wearing a Ukrainian military uniform and carried a firearm, which signifies her undisputed status as a POW, according to Article 4 of the Third Geneva Convention. On June 20, 2014, the terrorists transferred Nadiya to the custody of Russian intelligence officers, who put a sack on her head and illegally transported her to Russia against her will. Russian authorities disingenuously claimed that this brave Ukrainian pilot “attempted to enter Russia as a refugee,” which is one of Russia’s many lies with respect to its illicit activities in Ukraine. Nadiya Savchenko is being unlawfully held in a civilian prison in Moscow, where she stands accused of complicity in the deaths of two Russian journalists, whose lives ended during a mortar attack on terrorist positions outside Luhansk. In reality, evidence shows that she was kidnapped an hour before the attack that killed the journalists. Furthermore, under the Geneva Conventions, she cannot be charged with a criminal offense under the laws of another country. For any alleged wrongdoing, of which she is clearly innocent, Savchenko could be tried only according to international justice mechanisms under the laws of war. If Putin cared about the norms of the international law, he would have to admit that Russia is a direct participant in the Ukrainian conflict, having armed, trained and directed terrorists in Ukraine. Russia continues to operate as a rogue nation, ignoring the standards of the Geneva Conventions. The Kremlin ventured far outside of its international entitlements by attempting to try members of Ukraine’s military under Russia’s criminal laws. The international community is not doing enough to address many egregious violations by Russia. A once great nation squandered its potential under Putin’s disastrous leadership, having been turned into a glorified gas station, ruled by mobsters. Simply because Russia’s violations are so numerous, doesn’t mean that the world should accept its lawlessness as a given. Nadiya Savchenko is being denied urgently-needed medical attention, placing her health in serious peril. She is also being denied communication with her legal counsel. The international community should stand together in demanding the immediate release of Nadiya Savchenko and the other Ukrainian POWs. Every minute of their unlawful detention in Russian prisons is a minute too long.